Due to US Postal regulations, chemicals cannot be shipped via Air or through the US Postal Services. Therefore they can only travel to the 48 states via UPS Ground. Shipping advice: One bottle of a chemical shipped via UPS will cost more than the bottle. A fast acting specially formulated glass etching compound that lets you create permanently etched designs on windows, mirrors and household glassware. Create your own custom glass etching stencil or use a pre made stencil like Rub N Etch. 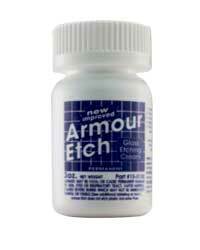 This unique glass etching cream allows anyone to personalize and decorate glass or mirrors in minutes with no previous experience. Not intended for use by children. Will NOT etch Pyrex or plastics. NOT recommended for etching large solid areas of glass. Designed to preserve your mark on glass during cutting, sawing and grinding. Washes off with soap & warm water or glass & flux cleaners. Your mark will stay on the glass until you wash it off. 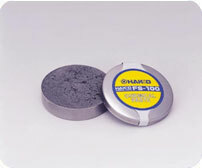 The Hakko FS-100 paste re-tins and helps restore heavily oxidized soldering iron tips back to useful life. 100% lead-free. A solid block of Ammonium Chloride for cleaning oxidation and crud off of your iron tip. (4oz.) Not needed for use with the Hakko FX-601.